Refreshing Daily in God's Word: Daily Devotion: Do You Know About The First Fatal Air Crash? 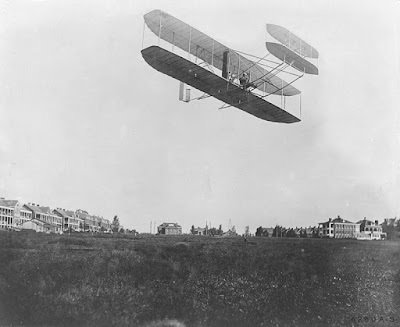 As 2,000 people watched, Orville Wright and Lieutenant Thomas E. Selfridge soared 150 feet over Fort Myer, Virginia. It was September 17, 1908. Wright was demonstrating his latest airplane for the army as Selfridge, cofounder of the Aerial Experiment Association, assessed its military value. During the fourth and final lap, a guy wire broke loose and fouled a propeller. The plane, said one eyewitness, “came down like a bird shot dead in full flight.” Orville’s left leg and hip were smashed; Selfridge, his skull fractured, died that night. While Orville’s injuries and Thomas’ death were both tragic, one of the greatest tragedies that I endure as a pastor is watching one suffer and struggle because they have fallen out of love with God and in love with the world. ✞ Remember a falling out with God is worse than falling from the sky.